Sept. 4, 2018 - From facial recognition to medical diagnostics to self-driving cars, artificial intelligence is becoming a fixture in our everyday lives. But how does AI fit into your sawmill operation? 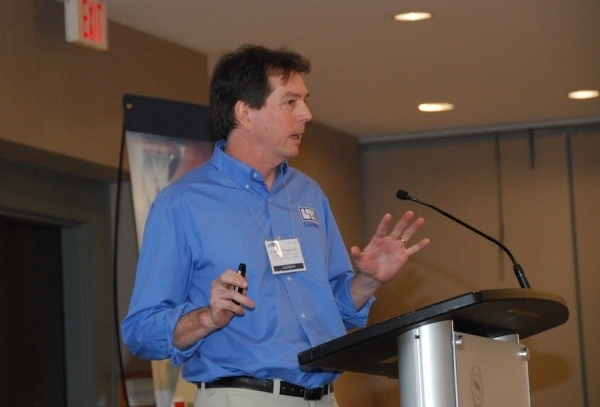 Lucidyne’s Patrick Freeman presents at OptiSaw West in Vancouver in June. Get answers to this question and more at OptiSaw – the one-day education forum for those driving the future of sawmilling. Hosted by CFI magazine, OptiSaw is returning to Eastern Canada to hold an information-packed event in Montreal on Nov. 28. Back by popular demand after his presentation at OptiSaw West in Vancouver in June, Lucidyne’s Patrick Freeman will discuss how they are using the newest form of artificial intelligence technology to train the GradeScan automated scanner/optimizer. The system learns to grade lumber like a human grader learns: by example. Freeman will lead a discussion on how this technology can maximize your fibre and value recovery.